Christmas is here and what to buy for your friends and loved ones? You want to purchase something that they will enjoy, use or maybe even something they desperately need. Maybe a gift that will relieve their pain doing normal daily activities and give them back some of the independence they have lost over the years due to the aging process, arthritis, diabetes or one of dozens other disabling afflictions. Maybe your Dad just had back surgery or a major joint replacement and his mobility is dramatically restricted for the next 6-8 months or your sister is pregnant and has bending issues. Valet Product Line has officially transitioned to manufacture and marketing only and has been moving in that direction for over a year. The company is getting attention from around the globe in the medical assisted living industry with their Shoe Boot Valet. Their newly patented Sock Valet and Boot Valet, coming to the marketplace in 2017, will add to their product line of “one of a kind” devices and will assist millions of elderly and mobility challenged people deal with pain and give back lost independence on a daily basis. Valet Product Line (VPL), owners and manufacturer of the unique Shoe Boot Valet (SBV) and our upcoming Sock Valet (SV), transitioned to manufacture and marketing only in 2016. The Shoe Boot Valet is the only device designed to assist the elderly and mobility challenged pull on and take off their footwear (shoes and boots) with no bending or reaching required. The SBV has a gripping mechanism that slips over the heel of the shoe, boot or slipper and allows the user to slide their foot into the footwear; a cam grips the shoe and you pull the shoe or boot on just by lifting or pulling on the device handle. The harder you pull the tighter the cam grips; little to no grip strength is required. VPL patented and attached a bootjack that pops off any shoe or boot with ease. You can use the device standing or sitting and the whole device weighs approximately one pound. Sometimes you can’t see the forest for the trees. Valet Product Line is known for their unique “one of a kind” products specifically designed to assist the elderly and mobility challenged pull on and take off their shoes, boots and socks with no bending or reaching required. Our consumer base is targeted to a wide range of diseases, afflictions, handicaps, etc. Arthritis, diabetes, strokes, major orthopedic surgeries lead the pack or are at the very top of our consumer base. For some reason we bypassed pregnancy as a medical condition and should not have been surprised and should have known that there is a mobility problem there and the interest in that market is huge. It is hard to imagine how some later stage pregnant women put on and take off their shoes, boots and socks. How uncomfortable that must be, especially if it is there favorite pair of fashion boots. Our revolutionary Shoe Boot Valet and Sock Valet make all these different issues very simple with no pain or lack of independence whatsoever and is the only product on the market that does. The assisted living industry provides some wonderful products but many lack convenience of use outside of the home type environment. Many of these devices are desperately needed and restrict travel and other getting out of the house excursions. Valet Product Line is becoming increasing known for the uniqueness of its products and the wonderful service they provide. No other products come close to the utility of their products and the service they provide in putting on and taking off socks, shoes, boots… with no bending or reaching required. 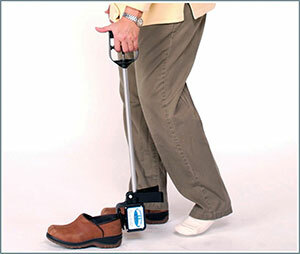 Product Description: Daily activity assist device for putting on and removing footwear. The Shoe & Boot Valet is a non-prescription, breakthrough device that represents a significant advance for people with difficulty putting on and taking off footwear due to limited or painful mobility.